Can you believe the 2014 season is over? After 16 weeks of excitement and turmoil, we've got our champions. If you were one of the winners, congratulations on your success. If you were not a winner, good luck next year. Now, let's analyze the Running Backs of 2014, and rank how they did in weeks 14-16. 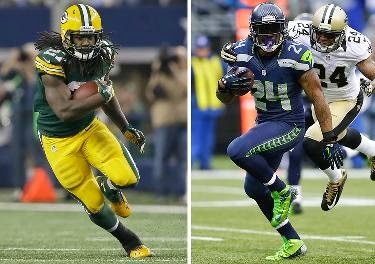 1) Le'Veon Bell, Eddie Lacy, Marshawn Lynch, and DeMarco Murray were beasts for most of the year, and it continued in the fantasy playoffs. Additionally, C.J. Anderson, Joique Bell, Arian Foster, Matt Forte and Fred Jackson never dropped out of the top 16 over the final three weeks. 2) Jamaal Charles, Mark Ingram and LeSean McCoy all had less than stellar playoff performances. 3) Matt Asiata, Lamar Miller, and Jonathan Stewart were all under the radar contributors in the 2014 playoffs. 4) Latavious Murray and Andre Williams were solid RB2s this year, but will they have their chance to continue their success next year? 5) Frank Gore just won't stop. He's been incredible in fantasy football playoffs for his last 5 seasons. From 2009 to 2014 (excluding the 2010 season due to injury), Gore has averaged 97.8 total yards and 0.6 TDs per game. That's called long term production folks! A) The 2013 NFL draft class has five highly ranked RBs as of the end of 2014, though none were picked in the 1st round. Le'Veon Bell, Eddie Lacy, Gio Bernard, Andre Ellington and Latavious Murray could all be very productive in 2015. B) Can LeSean McCoy, Adrian Peterson, Doug Martin and Alfred Morris bounce back? We think so, making them solid buy low candidates. C) We don't see Justin Forsett as the answer in Baltimore, so we would sell high if given the opportunity. D) Jeremy Hill, Carlos Hyde, Tre Mason, and Jerick McKinnon could all be major contributors in 2015 as sophomores.